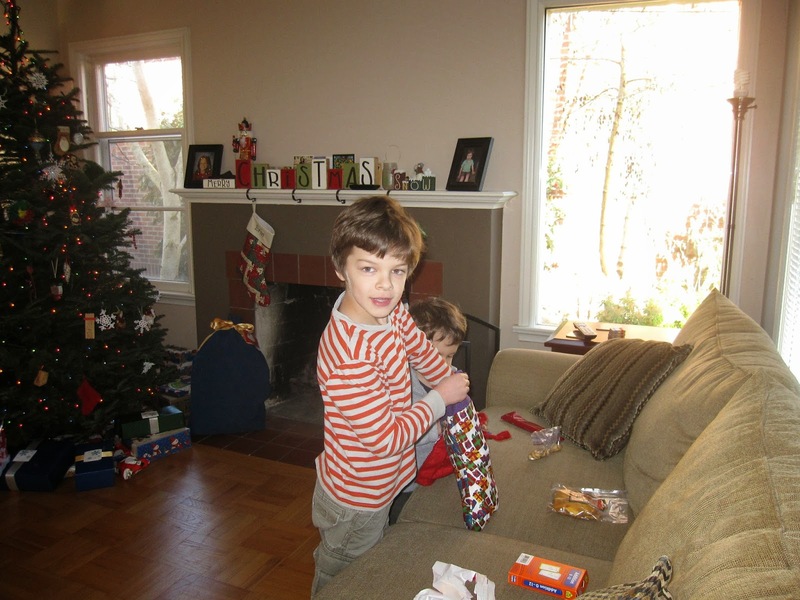 Once again, a lovely Christmas was had in the Phelps household. Malcolm keeps asking to do Christmas again. I forgot to get the turkey out as soon as I should have, so I spent some of Christmas Eve morning finishing thawing it in the sink with cold water. While I did that and played with the kids and tried to finish up some household cleaning items, Ryan busily wrapped gifts. Once the turkey was in the oven and Ryan was done, it was my turn to wrap away. Thankfully I had done some wrapping over the previous few days. We were both grateful to have the wrapping done before dinner. Our Christmas Eve dinner was basically a repeat of Thanksgiving because Ryan had enjoyed the turkey at thanksgiving so much. I forgot to get out and buy rolls (and I rarely bother to make rolls since we can get such good ones at local bakeries) and we had broccoli instead of chard, and no dessert since we've got tons of goodies around already. It was delicious. Then we finished off the last advent presents and took down the final countdown chain and sent Malcolm off to bed. Gareth, Ryan, and myself settled down for our traditional viewing of the George C. Scott A Christmas Carol and some Theo hot chocolate. After that was over we got Gareth off to bed. Ryan and I were feeling quite tired by this point, but did need to do a little clean up and get our blueberry breakfast bake put together as well as put out presents/fill stockings. 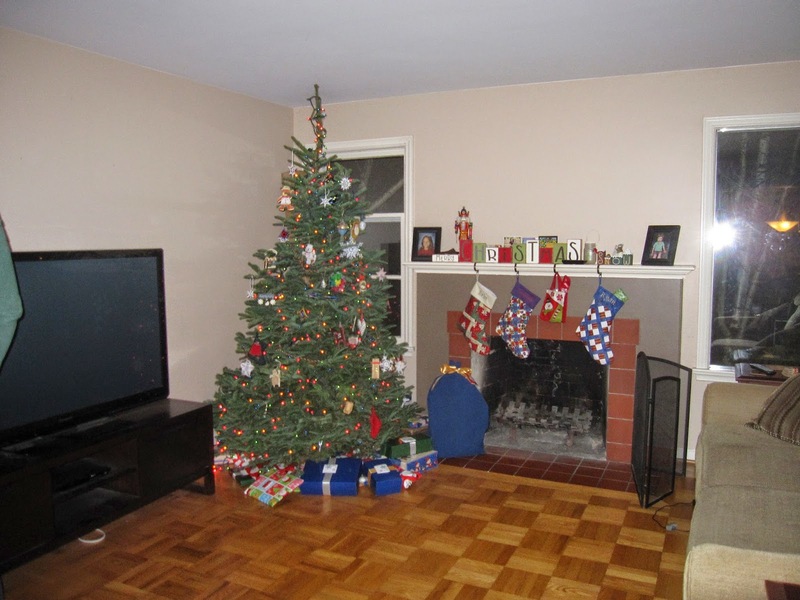 Thanks to having the wrapping all complete, we were done by 11 pm. The boys didn't stir in the morning until 8:45. Every year I'm grateful that our kids sleep in, even on Christmas, and for the Seattle clouds that help them sleep in. The only problem with them waking up late was that Mal wanted to eat something right away. Once I was showered and dressed I got our breakfast in the oven and got Malcolm up and then let him munch on a banana and some bread while we waited for Ryan to be ready. 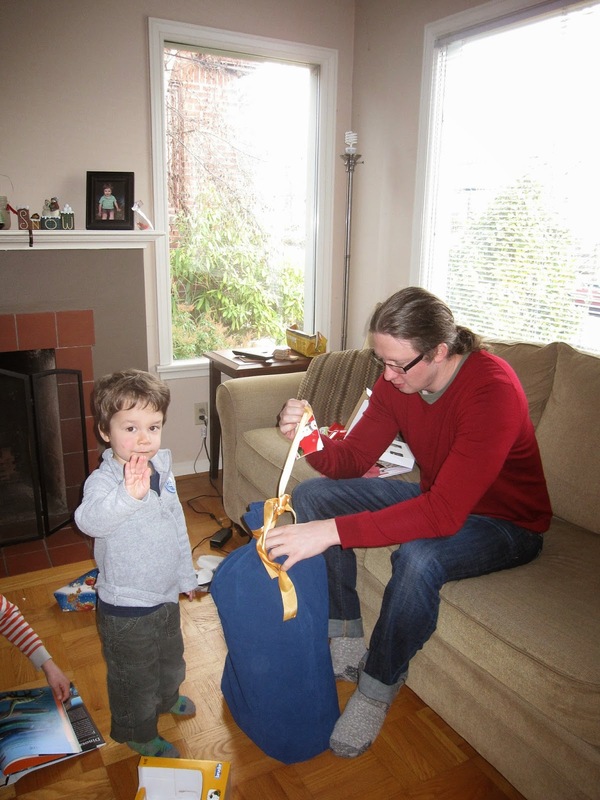 Stockings were opened - Gareth found a whoopee cushion in his and Mal found a slide whistle. 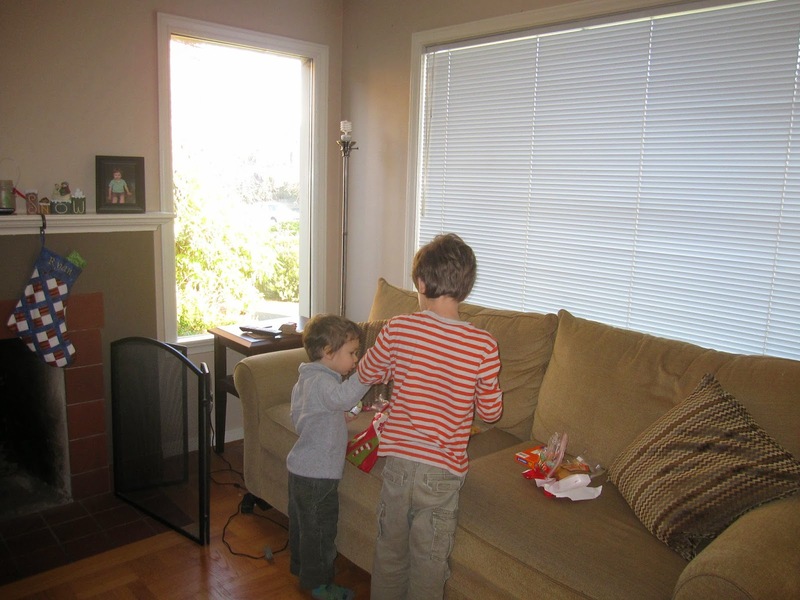 They both wanted to scarf down the candy and were sad when we cut them off after a few pieces. Breakfast took a few minutes more, so we let them open a gift each and then we ate our traditional breakfast. After breakfast we brought up our fake logs (poop logs as we call them, because that's what they look like (thankfully don't smell like that)) and had our first ever fire in the fireplace here. Malcolm spent the next few days begging to do another fire in the fireplace. Malcolm was a lot more interested in presents this year and helped me open some of mine as well as opening his own. 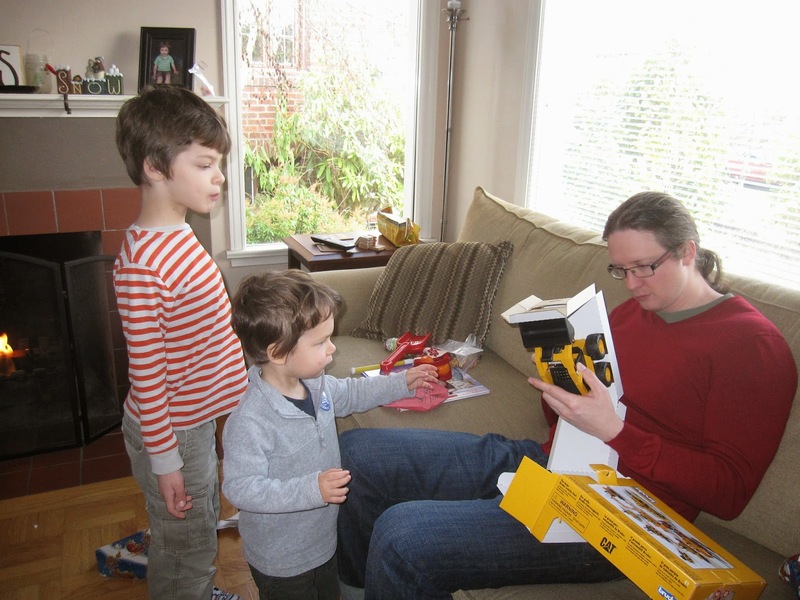 He got some dinosaurs, construction vehicles, a small basketball hoop, and books and has been having fun with them all. When it was time for nap he was not at all happy about it, but was more willing to go when I told him he could take a dinosaur with him. Gareth was excited to get a watch (he's been asking for one for years) and goggles for swimming and a set of Minecraft books and was particularly excited to open his last gift and see that it was a Kindle. Ryan picked up some magic trick trinkets for him, and he's been having fun with those as well. We tried to play with his new Jenga game the next morning, and he thought it was a lot of fun. But then Mal came along and kept knocking it over ("that was so awesome! "), so a real game had to wait until Mal wasn't around. Gareth at one point said, "How did Santa wrap that? 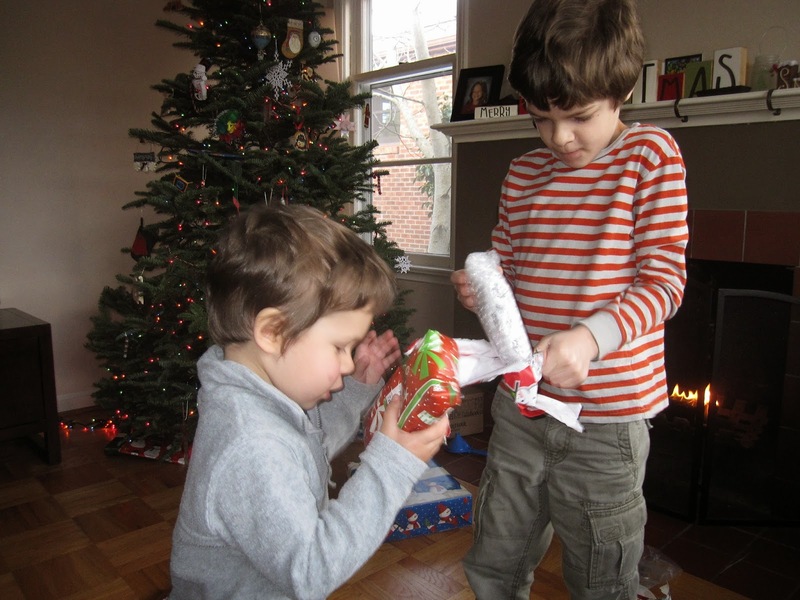 The gifts from Santa are wrapped in the same paper that we have!" To which Ryan and I responded, "That's an interesting observation." It's fun to see him start to make such observations and know that in the next couple years he'll likely realize that Santa is just pretend. While Mal was napping the rest of us watched "Elf". Leftover turkey made up our Christmas dinner, followed by a nice video chat with Ryan's family, and then we watched "It's a Wonderful Life" with Gareth. Ha, that is funny about the wrapping paper. I thought Santa should wrap, Mike's family did, but I wondered if they would notice how I only have two different paper prints for wrapping paper. Early on (before kids) I thought of having a roll or two that only Santa uses. But that's just way too much trouble. Andrea, it's taken Gareth until almost 8 to notice, so using the same wrapping paper is not something I'd worry too much about. By 8 they've only got a year or two more of believing anyway. We tend to like to keep the most "exciting" gift for last, so that's partly why we wrap Santa gifts. Easier to keep it to last if it's wrapped. 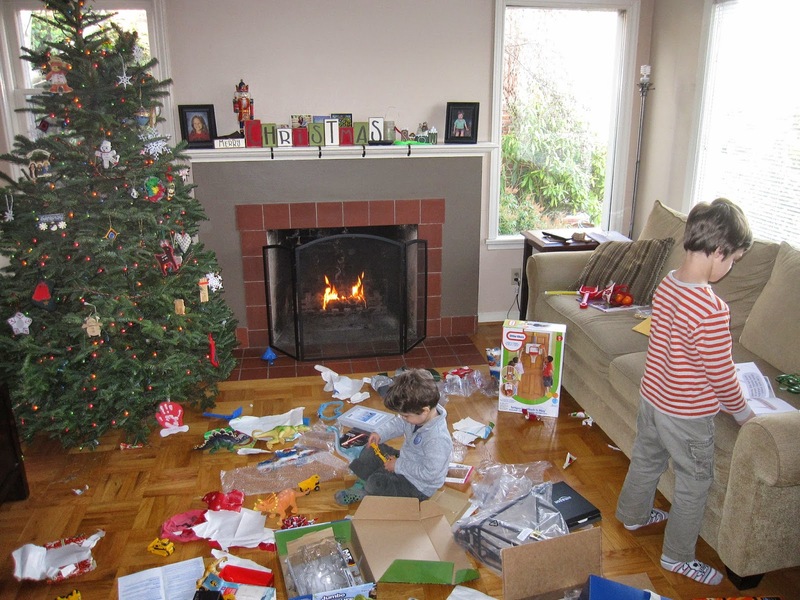 Plus, kids just enjoy unwrapping stuff. Adds to the excitement.